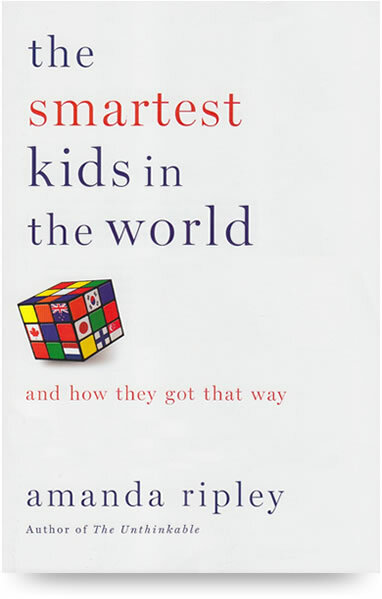 A few days after my mom left London, she emailed to say she’d picked up a copy of The Smartest Kids in the World in the airport to read on her flight home and that it was fantastic. So obviously, one of the first things I did once I arrived in Vegas was snag her copy and read the whole thing in a few days. Yesterday, I spent a good 30 minutes telling Bart all my favorite parts while we were FaceTiming (the girls kept wondering when I’d be done and he could get back to singing them silly songs). It’s really a terrific and fascinating book. This is the story of three different countries and why their students are the top-performing children in the world, and what those countries do differently than the United States. (News flash: The U.S. is not all that impressive in the education game. I know you are shocked). The three countries are South Korea (not a big surprise there), Finland, and Poland. In addition to a fair amount of background about their educational systems, she also follows three high school students who are U.S. foreign exchange students in each of these countries, so she gets a pretty good peek at what the daily life is like in these schools. No tech in the classroom. No smart boards, no iPads, no video cameras or high-tech clickers. Most classrooms won’t even allow students to use calculators, so the students are really good at doing basic calculations in seconds. Becoming a teacher is extremely competitive and rigorous. You have to be the best and brightest to get into a teaching program, somewhere on par with getting into med school in the U.S. Whereas in the U.S., most education programs are extremely easy and not well-respected at all. This means the schools can give the teachers a lot more autonomy and the teachers are really experts in their fields. No sports in schools. Sports are extremely expensive to run in schools and end up benefiting a tiny percentage of the students. Sports are not part of school in most countries. Tracking happens very late in a school. In the U.S., students start being separated into gifted programs as early as first or second grade. As soon as this happens, all the other kids start to fall behind since they see themselves as lesser. Other countries don’t do it until midway through high school and it brings up the scores for everyone (in Poland, they delayed tracking for one year and the test scores went up like crazy. Then the next year, when the tracking happened, the test scores dropped just as they had in previous years). Other countries don’t spend so much time thinking and talking about poverty, single-families, race, and background. Teachers in other countries are less like friends to their students and more an authority figure that teaches to the whole group, expecting everyone to perform. And mainly, the students step up to meet those standards. In the U.S., the education focuses so much attention (and blame) on diversity, economic inequality, and it seems to just hurt everyone (there are some really interesting studies about classrooms where teachers are told that a random group of students are exceptional and they treat those children differently, give them better grades, and think more highly of them, even though those children were chosen totally at random. And the opposite happens when they are told beforehand that certain students are slow, disadvantaged, or trouble-makers). Money is funneled to low-performing schools. Since school funding has a lot to do with property taxes in the U.S., rich neighborhoods have highly funded schools and poor neighborhoods have very little money. And if students don’t perform on standardized tests, federal funding can get cut. In other countries, more money and resources is funneled to the schools that need help. Also, the U.S. spends WAY more money on education than other countries, but with very little to show for all that spending. Failure is expected. School is considered difficult, and difficult things require repeated failure until you learn them. Whereas failing in the U.S. is considered detrimental to students, the students in other countries are used to the fact that they’re going to have to fail a few times before they master a skill. And they aren’t crushed by it. Parents are involved very differently. Instead of joining the PTA or coaching sports, parents work with their kids on homework and academics. And all the research shows that being involved at school basically doesn’t benefit your child academically at all, unless you involvement is academic. (So if you’ve never joined the PTA, consider this official pass). All of that is not to say that these countries have perfected education. South Korea, especially, is a total pressure cooker, and the high performance of their students comes at the expense of spending ALL DAY at school, both public education all day and then private tutoring in the evenings. Finland, on the other hand, gets even better scores and their students spend far less time in school and aren’t operating under unbelievable stress and pressure for twelve years. And a lot of the things these countries are doing could be replicated without too much expense or difficulty in the U.S.The one thing that showed big results across the board in all countries was parents who read to their children from an early age (I’m sure you never saw that one coming). And then, as their kids got older, they discussed current events and continued to read together or at least discuss the things they were reading individually. So pull out the picture books. Of course, with Ella hitting the kindergarten age this next summer (my baby! the time! etc), this is all top of mind for me, and I especially appreciated the appendix that talked about how to find a world-class education for your child no matter where you are (and without having to spend $30k a year for elementary school). Mainly, Bart is thanking his lucky stars that we were separated by an ocean and the entire continental U.S. while I was reading it or he would have gotten a page-by-page summary of this book over the last week. I belong to a small education group (which is just like what it sounds–we read about and discuss education), and we talked about this book a few months ago (we actually just listened to an interview with Amanda Ripley because the hold lists were unbelievably long). Ever since that discussion, I've wanted to read the actual book. This is the kind of stuff that completely fascinates me. Both interesting and discouraging. I'm not sure how change will ever happen in American education…but it is so desperately needed! Especially the disparity between rich schools and poor schools. Thanks for sharing, I just put myself on the hold list for this! Wow, this book sounds fascinating. One I might not have picked up on my own, but you've definitely got me interested! Please research how South Korean children act, how they are treated, and what is expected of them. As much as I deplore the state of our education system, we do not want that for our children. At least, I don't. My daughter is a teacher in SK. E-mail me if you are interested. (You are friend with her on Goodreads.) Not arguing. 🙂 Will watch for this book. It sounds interesting. You mentioned the pressure cooker… Suicide rate is extremely high. I bought this one right when it came out….and then it's sat on my TBR pile ever since. I need to read it, though….I'm pretty sure I will have lots to tell my husband after I'm done, too, most of which he probably won't really be that interested in! I have so many thoughts on this. SO MANY. First I get really, really testy when people bring up how America spends too much time focusing on race and low-income students. Mostly because people use this as an excuse for cutting programs that benefit those students. However, we do have a culture of identifying students that are people of color, and lower-income students as "deficient" and it does color how they are treated in a negative way. For example, a school in my district took all their teachers on a "bus tour" of all the low-income neighborhoods in their boundaries. The school police officer stood at the head of the bus, and used a megaphone to shout to the teachers "THAT IS PROBABLY A DRUG HOUSE. IF IT'S NOT, IT'S ONE OF THOSE HOUSES FILLED WITH TEN KIDS TO ONE ROOM. THAT'S HOW THESE PEOPLE LIVE. This is where all the _______live! The other people, the ______live here!" The windows of the bus were open, and basically the entire neighborhood could hear him talking about how deficient and problematic they were. Plus, the teachers now had this image of their students as automatic "problems" to be dealt with. But, part of my thesis in grad school was focusing on how student achievement actually improves when race and income are incorporated into the system effectively. Academically, it doesn't make sense to insist on maintaining the "old white guy" narrative as the pinnacle of learning. There are tons of authors, thinkers, scientists, etc. that better represent the fact that America is a multicultural nation. And when students "see themselves" in their curriculum, they perform better. And no matter how authoritative the teacher, a kid who comes to school hungry because his family can't afford food is never going to perform as well as a student who is well fed. Sorry. I just get so testy when people (not you, and not necessarily the author) talk about how American's are performing poorly just because we focus on the fact that our population is more economically and racially diverse than Finland and South Korea. I'll probably read the book over my break and bombard you with my thoughts (as is my nature, and you don't have to respond.) I'm such a huge cheerleader for public ed, I think it is the cornerstone of a democratic society, but our system is just so broken on a thousand different levels, and so often these books get written, but little action is taken. Mostly because I think the American public is largely apathetic to improving the overall system. Oh I am totally reading this! Living here in NC has totally opened my eyes to how crazy school systems can be! The difference between schools in Durham and Cary is like night and day… and Cary is full of rich people (read: we're not rich) and highly rated schools, and Durham has so many low income families (there are a few neighborhood exceptions of course) and poor school ratings. I just finished this yesterday! It was awesome! I am going to make Adam read it too, as a future educator! I love reading/hearing about education. My husband always talks to me about the research papers and such he has to read for his education classes, and I enjoy our discussions! I would have gladly sat through a page by page summary of this book! I've read lots about South Korea and Finland doing great (with the lifestyle sacrifice caveats for the former country) but never Poland! And I had never heard the thing about sport not being included…I wonder how kids in those countries play sport? Or don't they? So interesting! My son is only 16 months but I do wonder about how to choose schools. I have to say the idea of putting kids into streams at such a young age gives me the heebie jeebies but I don't think that's done here in Australia. Feel free to write another post sharing ideas on how to make the most of education where you are 🙂 Thanks for the review! I haven't read the book, but I'm a university student in Finland (originally from Canada). I can really relate to your comment that failure is expected – our professors remind us regularly that "learning is more important than grades"(!). I will definitely have to check out this book, I am really interested to learn more about Poland and South Korea especially, and also more about Finland! I look forward to reading this. I'm sure it's both eye opening and depressing at the same time! Any thoughts on what you heard about education in the UK while living there? Somewhat on topic, you mentioned the other day how Ella started reading on her own. My daughter is about her age and her preschool teacher had not been helpful with tips. We read all the time and always have. Anything you'd suggest to get her started? We used Phonics Pathways (available on Amazon or we just checked it out from the library) and I was really happy with it. We did a page or two a day and I didn't have to think about anything – just open the book and work our way through. Super easy and really well done, I thought. At first she was only semi-interested but over the summer, she suddenly caught the vision and wanted to do 5-10 pages a day. Obviously, I read to Ella all the time too, but I never felt like she was going to learn to read without some structured help, and that's exactly what the book gave me. And I didn't have to figure out how to teach her, which was really stressful to me. I could just sit down and let the book do it for me step-by-step. There's a similar book as well called "How Children Succeed." You can find a description and reviews via Amazon. I need to make a note on this one: "Becoming a teacher is extremely competitive and rigorous. You have to be the best and brightest to get into a teaching program, somewhere on par with getting into med school in the U.S. Whereas in the U.S., most education programs are extremely easy and not well-respected at all. This means the schools can give the teachers a lot more autonomy and the teachers are really experts in their fields." It may be true that for elementary teachers, some of the programs themselves are easier to get into, but in the city in which I live, getting hired is the trick. You might be competing against 100 other people for a single job. My colleagues at my high school nearly, without exception, all have master's degrees. In addition, most of them worked in industry before becoming teachers, particularly those in my science department. I think we need to be really careful when you go down this path. Teacher training and certification varies from state to state, but in Oregon it is incredibly rigorous. I spent thousands of my own money to get a master's degree and then hundreds more over the last year to test and certify. This was not something I or my colleagues took lightly. Getting more people into education is about respecting teachers MORE, not running them down. I used to be proud to be a teacher; now I'm almost afraid of how badly people are going to run down my profession and our schools when I tell them what I do for a living. Secondly, because of exceptionally high tax rates and a vast social safety network, these countries have almost NO poverty rate. America's poverty rate is atrocious. So while spending per pupil is not necessarily any more in these countries, spending on children BEFORE they ever come to school is vastly different–state run daycares, a year of paid maternity leave (Finland) so moms are home with babies, fully funded pre-K care. Thirdly. The other great thing Finland does is that don't teach formal reading until age . . . wait for it . . . SEVEN. In the US we have pushed earlier and earlier reading when many children just aren't ready for it. (All three of my boys, two of whom are now awesome readers, a third who is just emerging. It didn't click for any of them until they were almost 8). So when they aren't fluent by age six we start classifying them. And though I'm all for early intervention and help where needed, I'm also a big advocate of just letting children be children. They only get one shot at it. In the book the Korean educational system is actually viewed in a negative light in a sense, even by the Koreans. It tells the story of one boy who stabbed his mother to death and hid her body for eight months to conceal a poor test score from her. However, the suicide rate in Korea for school age children is significantly lower than the teen suicide rate in the US and Finland (per the book) while the adult suicide rate is higher.